'The only book on quality I've ever enjoyed...' Rural Health Service Quality Manager. You need a Great Quality System to create Great Care...and now, here's the blueprint to help you to do just that. Are you looking for a quality system that drives great experiences for your consumers? Are you developing or refreshing your existing quality system to meet the challenges of evolving standards and compliance requirements? Tired of quality systems that devour time and resources without tangible results? 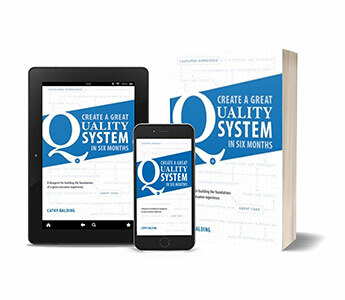 ‘Create a Great Quality System In Six Months: A blueprint for building the foundations of a great consumer experience’ is a step by step, month by month blueprint for building and implementing a quality system that staff will want to use to create a great consumer experience for every person, every time. The SQS Strategic Quality System blueprint is based on the literature, applied research and real world experience. It builds in buy-in: instead of developing your quality system and then starting on the long journey to gaining staff engagement, ‘Create a Great Quality System’ does both at once – merging quality mechanics with quality mindsets. Engage all areas of the organisation in embracing their role in creating great care and services – from board to bedside; chairside to chiefs. Evaluate the effectiveness of your current quality system and your organisation’s quality system ‘maturity’. Click the link below for a preview sample of what's inside! Create a Great Quality System is the perfect implementation partner to my first book ‘The Strategic Quality Manager Handbook’. SQM explains the ‘What and Why’; CGQS describes the ‘How To’. Together they provide the framework and information required to build sustainable, effective quality systems and roles that get real results. 'Fantastic! Cathy has done an excellent job summarising the materials from a number of different sources to make an easy blueprint for action. Follow this for success in quality and safety in health care.' Sandra Leggat, Professor of Health Services Management, La Trobe University, Victoria.